Well gang it's 2012 and quite a few things have changed. Gay Marriage has been legalized in New York State, Drag Queens have their own TV show, teens in Hudson, NY voted two guys to reign over their prom, and now Bear Albany is taking it to the next level with our very own PROM NIGHT this Memorial Day Weekend! That's right, it's time to get dressed up, call up your friends, and dance with someone you're actually attracted to. But don't worry if you don't have a tuxedo or a date, because this is going to be YOUR PROM the way YOU WANT IT and there'll be plenty of hotties to dance with. Come wearing a tux, come wearing a T-shirt, or come shirtless with a bow tie, because how you look is entirely up to you. Best of all, we're all adults now so we can have a few drinks, kiss whomever we want, and don't have to be home by midnight. As always, Bear Albany events have no registration fees, and the hotel has a FREE SHUTTLE, so you don't have to drive to the bars! HOTEL INFORMATION: Although the Host Hotel has officially sold out for this weekend, the Mariott Townplace Suites said you should try to book; if nothing's available to ask that your name be put on a waiting list if rooms become available; and they will call you back when cancellations come in. 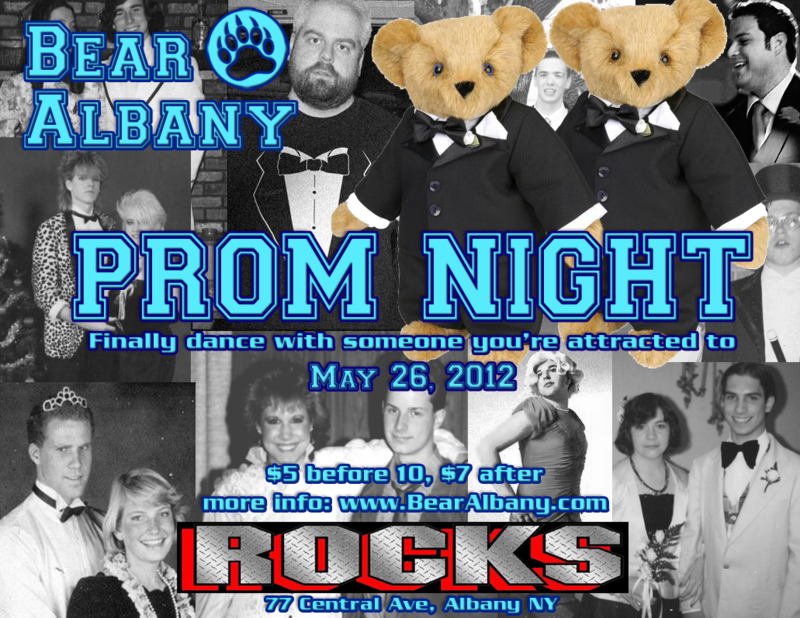 Don't forget to ask for the BEAR ALBANY DISCOUNT when calling (518-860-1500). If you're in the mood for a little adventure, go visit Two Bears Provisions at the Sharon Springs Garden Party May 26-27, 2012, in the village of Sharon Springs, NY. Two Bears Provisions will have all your favorite spices, salad dressings, BBQ sauces, and granola, as well as a pulled pork lunch, fried chicken lunch, a chickpea polenta with garlic and roast red pepper aioli on a fresh bakery roll, local egg and leek tart, rhubarb crumble, and homemade lemonade for sale! Lots of vendors, lots of American Hotel, and lots of fun. You can visit Saturday or Sunday, or both! If you're looking for a great place to eat after a relaxing day of enjoying the local sites? Head over to McGeary's Pub and get 20% off your meals all weekend long. Just ask the waitress for the "Bear Albany discount" and enjoy a great meal from their deliciously diverse menu. They also have a great Happy Hour from 3pm to 7:30pm, where you'll get $2 and $3 Drafts and $3 Single Liquor well drinks. It's the perfect place to bring your buddies for dinner and drinks before heading out for the night. After brunch, head over to Colonie Center and join the JerrBear's gang for a Sunday afternoon movie showing of Men In Black 3. The showing time will be at 1:50pm, get to the theater a little after 1, pick up tickets and get seated. If you have Fandango you can purchase your tickets early. Then afterward swing by ROCKS for drinks and their free BBQ.